UPDATE February 2nd at 12:30pm EST - Thanks to a generous donation of 1.5 STEEM from @foxyspirit, I'm upping mine to 1.5 as well, so now 3 STEEM is up for grabs in the giveaway! If you've spent any time on the blockchain and/or Discord this week, I'm sure you've bumped into someone talking about @theycallmedan's contest to give away a 10K SP delegation for a year. So, to make a long story short (yeah, I know - too late...LOL), I thought I'd post this list of all the support posts that have found their way onto the blockchain this week. Then I got the idea that it might be a cool way to give a little appreciation back by having a random drawing for 1 Steem for all the non-steemitbloggers Steemians who've taken that extra step to support us! When the delegation contest ends, I'll choose ONE non-steemitblogger support post at random & send them 1 Steem as a THANK YOU! So who wants join the POWER HOUSE CREATIVES? that are in the drawing for a total of 3 Steem! There's still about 1 hour left to enter, so be sure to shout out with your link if you post about your support for the Steemit Bloggers (Power House Creatives) to win the 10k Steem Power delegation from @theycallmedan! Great post @traciyork.. Love it. Thanks for redeeming a putting one of my links. I have done at least 2 others and I have lost count of the resteems. I still believe we will get this. @p1eter - not a member voted and got us 5 more. Amazing, hey? You're very welcome, @fionasfavourites! Yeah, I actually only added one of mine the first go 'round, but I've already edited and added a handful more. This will be a work in progress for the next few days... LOL! And that's wicked awesome - thanks so much, @p1eter and friends! And thank you to YOU, @traciyork and @steemwitchery! FYI, at the moment there are 9 different posts from 6 different non-@steemitbloggers folks that qualify for the drawing for 1 Steem! 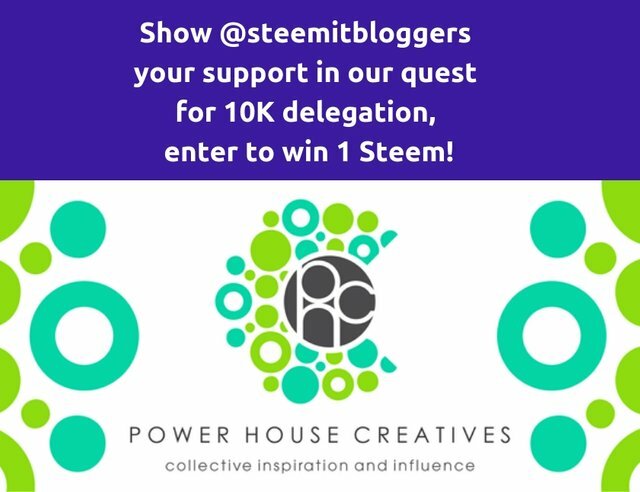 There's still time to enter, so be sure to shout out with your link if you post about your support for the Steemit Bloggers (Power House Creatives) to win the 10k Steem Power delegation from @theycallmedan! Awesomeness, @nickyhavey and thanks! I saw your offer - that's wicked cool! We're SOOOO close to winning this - I KNOW we can do it! You should put the URL of the Discord server on your Bio. Ahh, thanks for the suggestion @ond but I'm just a member of the Steemit Bloggers/Power House Creatives community. However, I will edit my post to make that clear - thanks again! I love how you have listed all the support posts!! We have to come up with a plan on how we can boost the account if we don't get the delegation!! I have some ideas..... Together, we can do this!!! That sounds awesome, @mariannewest and I agree - together we can make great things happen! Oh! I'm so hoping Steemitbloggers win! WHOO HOO! Thanks so much, @porters and I've added your post to the list/drawing! We're 15 votes behind at the moment, but I'm hoping we get a last minute surge to push us over the top. This is quite a "steemily" Jaynie's put together eh?